We’d love your help. 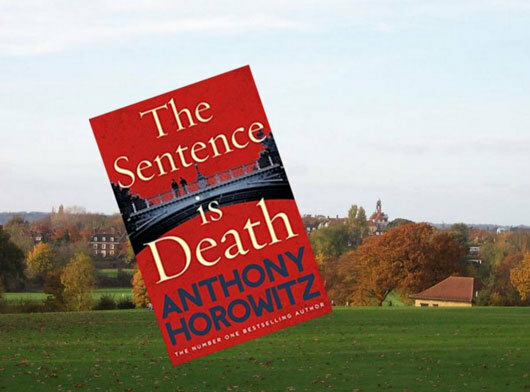 Let us know what’s wrong with this preview of The Sentence is Death by Anthony Horowitz. These, heard over the phone, were the last recorded words of successful celebrity-divorce lawyer Richard Pryce, found bludgeoned to death in his bachelor pad with a bottle of wine – a 1982 Chateau Lafite worth £3,000, to be precise. To ask other readers questions about The Sentence is Death, please sign up. Can someone help? Goodreads lists this books publication date as November 2018, but every place else I have looked including Amazon, B&N and Baker and Taylor does not have it coming out until June of 2019. I am a librarian, and I buy books so I need to know the correct pub date. Thanks in advance for any help! Shrabonti It's on Kindle, at least in India. Is this book appropriate for Age 14 Girl? Yeah, great read! This author, I like him. Not per definition a crime reader I am, but from Magpie Murders I'm kinda hooked on Horowitz. Utterly entertaining. Witty, clever, easy read & 'whodunnit', though I did not see it all coming... 4.3 maybe more. Loved it. Let #3 on private investigator Hawthorne aka Holmes and his assistant 'Watson' come soon. This series is recommended! Smooth-tongued divorce lawyer Richard Price is bludgeoned to death in his London home. What happened, who did it, an Yeah, great read! This author, I like him. Not per definition a crime reader I am, but from Magpie Murders I'm kinda hooked on Horowitz. Utterly entertaining. Witty, clever, easy read & 'whodunnit', though I did not see it all coming... 4.3 maybe more. Loved it. Let #3 on private investigator Hawthorne aka Holmes and his assistant 'Watson' come soon. This series is recommended! Annet LOVED it! :-) Thanks Lindsay! My second close encounter with Mr Horowitz was as good as the first one, and I'm already looking forward to another one. An enjoyable novel with a grand mystery and a bottle of a terribly expensive wine in the background. Hawthorne is back with his rather abrasive personality and his undoubted skill at finding clues and solving cases. Horowitz features again as himself acting as Hawthorne's sidekick attempting to solve not one but possibly two murders. Having the author actively involved in his own book makes for some interesting reading. Occasionally I sat back and wondered which bits were fact and which fiction, but in the end it really does not matter. The book is totally enjoyable and very easy to read. There Hawthorne is back with his rather abrasive personality and his undoubted skill at finding clues and solving cases. Horowitz features again as himself acting as Hawthorne's sidekick attempting to solve not one but possibly two murders. Having the author actively involved in his own book makes for some interesting reading. Occasionally I sat back and wondered which bits were fact and which fiction, but in the end it really does not matter. The book is totally enjoyable and very easy to read. There is a good story, well paced and interesting. The clues are all provided and although there is a surprise ending I managed to guess the culprit before Horowitz did. Sentence is Death starts with the murder of a divorce lawyer and Horowitz sets to write a second book of this case alongside working with Hawthorne. The victim had been threatened by a well-known, award winning and fiercely literary writer and his husband seems to be hiding things… Of course, there are also issues from the past that bubbles up in surface of the case. Who visited the victim before he died, and why is there a number on the crime scene? Keep in mind: One lie can ruin a thousand truths. Anthony Horowitz opens the heavy wrought iron gates on another stellar mystery that feels circa 1930. Anthony becomes a key figure in his own novel as he takes on the role of himself. Horowitz, you see, is the famed writer of Foyle's War, an on-going successful television saga in the UK. He's in the middle of filming a crucial scene on the streets of London when a cab pulls up and spoils the shot. Anthony recognizes the man who has just exited the Keep in mind: One lie can ruin a thousand truths. Anthony recognizes the man who has just exited the cab and is running towards him. Let's introduce you to former Detective Inspector Daniel Hawthorne. Hawthorne is now a "for hire" crime expert who works on random cases. He has convinced Anthony to write his biography. That entails riding shotgun with Hawthorne as he attempts to solve a case. Anthony signed on the dotted line with the buzz of crime/murder intrigue dancing staccato in his heart. Later, his common sense caught up with this pending madness. The body of an affluent divorce lawyer has been found in the posh section of Hampstead Heath. A teetotaler by choice, Richard Pryce is found to have been blungeoned with an expensive bottle of wine at the back of his once stately head. The number "182" has been dripping green paint on a wall alongside the staircase. There's no sign of forced entry. Hawthorne and Anthony peruse the crime scene. Hawthorne, typically, is short on words and long on rudeness. DI Cara Grunshaw of the Metro Police is none too happy to see this duo at the scene. Grunshaw will be dogging them throughout the novel.....because she can. The Sentence Is Death is a delightful read filled with the good, the bad, and the indifferent. Horowitz has a way with dialogue that is laugh-out-loud in some skillful scenarios. We'll also be finding out that Hawthorne is shedding a bit of his intricate layers of self-preservation. Something is brewing with this talented crime expert who is tight lipped and laced up like a kettle drum. We'll just have to see what Anthony Horowitz has in mind with the next one, shall we now? In the first book in this series, The Word Is Murder, Horowitz took the unusual step of placing himself in the book as the narrator, melding his real life with this fictional life as a writer engaged to write about PI Daniel Hawthorne's cases. This made for delightful and amusing reading as Horowitz stumbles through the case in the wake of Hawthorne's somewhat more astute detective work. I wasn't sure how well this would work in a second episode but am happy to report that if anything it worked In the first book in this series, The Word Is Murder, Horowitz took the unusual step of placing himself in the book as the narrator, melding his real life with this fictional life as a writer engaged to write about PI Daniel Hawthorne's cases. This made for delightful and amusing reading as Horowitz stumbles through the case in the wake of Hawthorne's somewhat more astute detective work. I wasn't sure how well this would work in a second episode but am happy to report that if anything it worked even better the second time around. The case this time involves a high profile divorce lawyer, Richard Pryce, a teetotaler bashed with an expensive bottle of wine and then stabbed to death with broken glass from the bottle. On the wall above the body the killer painted the number 182 in green paint. At the time Pryce had been involved in a major case involving a celebrity writer, Akira Anno, who immediately becomes their main suspect, as she was recently witnessed pouring a glass of wine over Pryce's head in a popular restaurant and then threatening to hit him with the bottle. Or could that just be what the police are meant to think? Baffled they call in ex-detective, PI Hawthorne and his biographical sidekick Horowitz to investigate. This is the 2nd novel in the Daniel Hawthorne, Private Investigator series by Anthony Horowitz. I have not read the 1st book 'The Word is Murder' nor in fact any other books by this author but quickly realised once I started this novel that times were going to change. I was so impressed and enjoyed reading this book that I had already purchased a couple of the authors other books before finishing it. For me the book had a feel of an older style of detective novel, maybe an Agatha Christie or more This is the 2nd novel in the Daniel Hawthorne, Private Investigator series by Anthony Horowitz. For me the book had a feel of an older style of detective novel, maybe an Agatha Christie or more likely Arthur Conan Doyle. Witty, well plotted and some excellent characters. I found the book a light read but intriguing and very enjoyable. The setting of the novel is a little bit unusual with the author being one of the main characters. 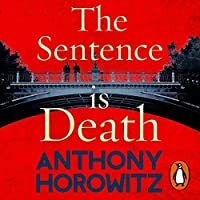 In the novel Anthony Horowitz is invited to write about the retired detective Daniel Hawthorne who still helps the Police solve difficult cases. Anthony tags along Hawthorne in much the same way that Hastings followed Poirot or Watson, Holmes, aiding and abetting along the way. The plot in this novel surrounds a divorce lawyer who has been murdered using an expensive bottle of wine and Hawthorne is invited in to assist. This is an intriguing read that is a refreshing change from some of the darker novels I also enjoy. Another witty crime book from Horowitz. If you liked The Word Is Murder, you will enjoy this one too. I thought it was better than the first, the case being more cohesive. There were convenient coincidences after all, but still an enjoyable read. As per usual I was hooked from the onset, and couldn’t put the book down. Interesting and engaging characters, a suspec Anthony Horowitz never disappoints! Just like The Word is Murder I love the chosen title The Sentence is Death, and how it was woven into the plot. Once again (again), Horowitz does not disappoint. I can honestly say that I will read whatever this man writes because he has a way of writing that is so hard not to love. It’s impossible. Both Horowitz and Hawthorne are in this novel, and I just want to say that their partnership is a very weird one. I wouldn’t call them friends, but they aren’t so much acquaintances? It’s so hard to describe what they are but that’s the fun think about their partnership. In this novel, we are introduced to a new character, Detective Cara, which you will easily despise. She is the protagonist of this novel and I can honestly say that I would’ve liked her to be killed off. The plot was once again extraordinarily twisty and it’s such a fun read! Horowitz’s murders are always fun to read because it’s a little funny how Horowitz tries to figure it out before Hawthorne every time. I do wanna say that it’s not a plot that you will figure out and I was very shocked when all was revealed. I could read Horowitz all day everyday, his books are just that amazing. The thing that I love most about every Horowitz books is how he writes himself as a writer. It’s just so interesting and it’s a very risky move but it works so well with the whole novel. It even makes it a little more enjoyable to read in a way. I would’ve liked to learn a little more about Hawthorne since we don’t really know who he is at all aside from this foul mouthed ex detective. I was almost sure that we would get a glimpse of what his childhood was like, but sadly we didn’t. Overall it’s a very good mystery with the best set of characters. One you will enjoy for sure! 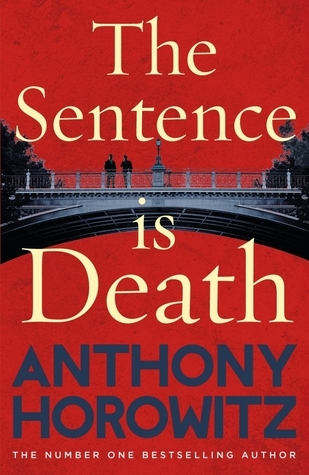 The Sentence is Death, the second novel to feature ex-policeman and Private Investigator Daniel Hawthorne, has an old-school, authentic atmosphere to it much like the crime classics of Agatha Christie and Arthur Conan Doyle. Horowitz focusses on mystery, suspense, intrigue and keeping it clean, rather than gratuitous violence or profanity, so if you like your reads clean, then this is a fantastic choice! Here, the author pairs up with Hawthorne to investigate the suspicious death of divorce lawye The Sentence is Death, the second novel to feature ex-policeman and Private Investigator Daniel Hawthorne, has an old-school, authentic atmosphere to it much like the crime classics of Agatha Christie and Arthur Conan Doyle. Horowitz focusses on mystery, suspense, intrigue and keeping it clean, rather than gratuitous violence or profanity, so if you like your reads clean, then this is a fantastic choice! Here, the author pairs up with Hawthorne to investigate the suspicious death of divorce lawyer Richard Pryce, and with many interesting characteristics, Anthony and Daniel race against time and against the police to solve the crime. As always, there are plenty of suspenseful moments, red herrings and discreet clues to whet your appetite but stop short of revealing too much. Hawthorne is a superb character, irritating and more than a little odd, but he is a proficient investigator and that's all that really matters in his line of work. His views are certainly outdated and likely to rub people up the wrong way. He sometimes comes across as having accidentally stepped out of the 70s or 80s into the modern day! Horowitz's use of the novel as a device for getting out some of his annoyances regarding the publishing world is a work of genius and an excellent and non-confrontational method in which to do so - biography masked as fiction! With a masterfully executed plot, exceptional characterisation and lots of unexpected surprises, I hope the following additions to the series are just as engaging! The author using himself as a character is most refreshing and certainly a unique selling point! This is the second book in this series and I am really enjoying it. Love that the author narrates it and is a character in the books. High recommended!! I very much enjoyed the first book and this one was also a good read. His style in this series is very chatty, like he is actually in the room telling you about his day. I’m still confused about how much of this is true.. thanks to Netgalley for an arc of this book. I adored, “The Word is Murder,” the first in the Daniel Hawthorne series, and was delighted to receive the second, “The Silence is Death,” for review. As before, Anthony Horowitz, or ‘Tony,’ as Hawthorne calls him, is very much telling the story as himself. Horowitz is working on a television series when the book begins, and Hawthorne’s reappearance is cleverly introduced – his arrival causing unintentional mayhem and annoyance. As before, Hawthorne is wonderfully irritating and yet has a bizarr I adored, “The Word is Murder,” the first in the Daniel Hawthorne series, and was delighted to receive the second, “The Silence is Death,” for review. As before, Anthony Horowitz, or ‘Tony,’ as Hawthorne calls him, is very much telling the story as himself. Horowitz is working on a television series when the book begins, and Hawthorne’s reappearance is cleverly introduced – his arrival causing unintentional mayhem and annoyance. As before, Hawthorne is wonderfully irritating and yet has a bizarre fascination for Horowitz. A sort of Seventies throwback, with definitely non-politically correct views and language; Horowitz finds him exasperating and is yet admiring of his ability to solve the most bizarre of crimes. Indeed, when Hawthorne states they have another murder to investigate, you know it will be something special. A divorce lawyer, Richard Pryce, has been murdered with an extremely expensive bottle of wine. This bizarre murder sees the pair becoming immersed in the investigation, with Horowitz gleefully having a lot of fun with the world of publishing. Pryce had been involved in a celebrity divorce, involving the author, Akira Anno, a writer of literary fiction, who visibly sneers at Horowitz. However, the divorce is only one possible strand of the investigation. This is a brilliantly executed plot, full of twists and turns. One motive involves the case that the lawyer was working on, then there is an incident in the past which may be involved and, then again, there are the usual issues with personal relationships and money. Along the way, Horowitz also tries to find out more about Hawthorne’s past and longs to solve the mystery before anyone else, while falling foul of the aggressive D.I. Cara Grunshaw and trying to juggle all of his writing commitments. I really feel that this is growing into an excellent series. In the novel, Horowitz claims to have a three book deal, writing about Hawthorne. You can only hope that he will continue the series beyond that point. It is a joy and I love the way that the author manages to insert so much of his own experiences, albeit in a fictional way, to create such an enjoyable read. I loved every part of the novel set around the world of publishing in particular, but every page was wonderfully enjoyable. I do feel that Daniel Hawthorne has a lot more to offer. Highly recommended. I received a copy of this book from the publisher, via NetGalley, for review. To be honest didn't I know a damn thing about the story before I started to read/listen to this book (yes I tend to mix it when I have the chance, listen at work, read and listen at home). And to find that Anthony Horowitz has written two books with himself as a character was a great joy (such a fun idea). He's like Private Investigator Daniel Hawthorne's own Watson. Although, their worki I've not read THE WORD IS MURDER, book one in this series, but I definitely want to after reading this one! If you a) like a baffling mystery and b) you’re a fan of Hercule Poirot then c) it is dead certain this novel will please you. I didn’t know at first but The Sentence is Death is actually the second in a series following PI Daniel Hawthorne and the writer, Anthony. That’s exactly right, the author of this novel is also acting as a main character, following the PI around in order to write a book (this book) about him. This infusion of some veritable facts mixed with fiction made it quite an except If you a) like a baffling mystery and b) you’re a fan of Hercule Poirot then c) it is dead certain this novel will please you. I didn’t know at first but The Sentence is Death is actually the second in a series following PI Daniel Hawthorne and the writer, Anthony. That’s exactly right, the author of this novel is also acting as a main character, following the PI around in order to write a book (this book) about him. This infusion of some veritable facts mixed with fiction made it quite an exceptional reading experience. What was told felt very realistic and authentic and Anthony’s first person POV made me feel as if I really came to know the author’s very thoughts, quite a contrast with the closed-off PI Daniel Hawthorne. Anthony Horowitz wrote several episodes of Poirot so it’s no wonder this novel was exactly my cup of tea. It does lean more towards the cosy mystery genre for me, a little lighter than the crime novels I usually read but I really liked the mystery, or should I say mysteries because there is not one but two cases to be solved. The story was complex enough to keep me highly entertained and much like Tony himself I was trawling behind Hawthorne and didn’t see the clues. Even though everything was written down word for word what was happening when they interviewed everyone involved, I couldn’t figure out the connection – if there even was one – between the puzzling murder of divorce lawyer Richard Price and another suspicious ‘incident’. There was a lot of guesswork because the novel could go forward in two very different directions with very different suspects. Did the past catch up with Price or was it indeed, as was their initial thought, one of Price’s clients? I had no idea which path it was going to follow, it was very cleverly written to keep the suspense to a maximum and it made me excited to find out the truth. I was also surprised, and very pleasantly so, the novel was set in a world of books and publicists and writers. Anthony’s character lends itself of course to dive into this world but there’s another character who’s a writer and so he finds himself in a bookshop, talking to a publicist and talking books. He refers to his first novel, The Word is Murder, a few times because that’s where he starts his cooperation with Daniel Hawthorne but I didn’t feel I missed anything and this novel is a good standalone. Both 'characters' of Hawthorne and Horowitz are brilliant, though Hawthorne is, at times, deeply flawed and an unlikable character - there are MANY things about him I dislike, and yet I can't help but want to read more about him because the story is told through Anthony Horowitz's humorous, entertaining voice. The plot is just as enjoyable as The Word is Murder, and though there are some (I feel) obvious parts that I did sort of see coming, there were also some really clever surprises as the story went on. This novel is satisfyingly self-aware, really clever and definitely entertaining - I loved every page. I'm already looking forward to book no.3! Private Investigator Daniel Hawthorne returns in the sequel to The Word Is Murder. Once again he teams up with sidekick Anthony Horowitz (the author himself) and once again they are on the trail of a murderer. As with their previous adventure there is plenty of humour, most of it at the author's expense! I love the eloquent plotting & the nice mixture of what I feel must be the "real" Anthony Horowitz & the "fictional" one. However, what I like most is that this novel is quite simply Fun Private Investigator Daniel Hawthorne returns in the sequel to The Word Is Murder. Once again he teams up with sidekick Anthony Horowitz (the author himself) and once again they are on the trail of a murderer. I like Anthony Horowitz books and this one was pretty different to the others I've read. Basically it's more of a slow-burn mystery. More of an Agatha Christie or Sherlock, old-style detective story. The core mystery seems to be based on a true story, though it was difficult to understand whether the elements (letters, historical articles etc.) which were added in to the story, were actually 'real' or part of the fictional book (I found this lack of clarity annoying, though perhaps it was my lack I like Anthony Horowitz books and this one was pretty different to the others I've read. The core mystery seems to be based on a true story, though it was difficult to understand whether the elements (letters, historical articles etc.) which were added in to the story, were actually 'real' or part of the fictional book (I found this lack of clarity annoying, though perhaps it was my lack of understanding??). The story follows a writer as he tracks the work of Detective Hawthorne. Hawthorne is aloof and a bit odd. He solves the case (of course) and the writer is trying to do the same and lagging behind horribly. The mystery was interesting enough and clear enough, and there are plenty of potential suspects. However, the story lacked tension for me and was not as riveting as I'd have liked. Well described characters are this author's strong point and this book does not disappoint. The other interesting point about this book is the fictional writer in the book seems to be styled on Horowitz himself (his name, where he lives, his experience of living in London and working as a famous writer etc.). This definitely added interest for me and might even have been a bit more interesting than the actual mystery. Summary - this is well written and a decent mystery. The curiosity element of having Horowitz making himself a character in it is probably the biggest attraction because the story is a bit slow. Immensely enjoyable and very clever crime thriller in which the author plays a most unusual role. Every bit as good as The Word Is Murder. Roll on book 3. Review to follow shortly on For Winter Nights. Horowitz has kept the promise he created in his first book in this series, alive and well in the second one. My only sadness is that I have no more Daniel Hawthorne to read at the moment and must wait for 'Tony' to write some more. The way he mixes up reality and fiction has me with my finger on my kindle and another on my search engine checking things out. Me, another Sherlock in the making. My first five-star-book in 2019 and I absolutely loved it! The story is gripping, I had no clue who the murderer was throughout the book but in the end it all made perfect sense, just how a good detective story should be! I don't know why but I just love the way Anthony Horowitz tells a story. I remember the feeling I had when I read the first of the novels where Anthony H appears as a character in his own novel. Wow I thought, did that just happen? Well it did and this is a second one just as good as the first with a twisty tale of intrigue. It's a fascinating angle for a book as Horowitz writes of his issues of waiting around on film sets, how writers might be on a film set . As the book opens he is - on the set of Foyle's war no less when Michael Kitchen walks by. This is surreal on many levels as he writes himself as a character in the book. It messes with your head but I love it! This is a very twisty tale and full of good old fashioned detective work - a series of strange numbers daubed on a wall, an expensive bottle of wine, a murder and some dark goings on in and around Hampstead Heath. The Old vic gets to play a challenging role if you excuse the theatrical pun. I wanted to like this more than I actually did as I think Mr Horowitz is a fine author. Sadly this felt like a rehash of the previous book in the series. Having said that, if you'd come to this book cold and read it as a standalone, it would be perfectly fine so perhaps I'm being overly critical. The whole DI Grunshaw subplot, however, was unnecessary and a bit ridiculous. If you’ve not read The Word is Murder yet then I highly recommend you do so before starting this book. The narrative is so unexpectedly crafted that I don’t think you could just jump into book 2 of this series without reading the first book to feature Hawthorne, a unique detective who could give Sherlock Holmes a good run for his money any day of the week! Once again a baffling murder case means the police call in Private Investigator Daniel Hawthorne and he takes along his partner in crime, the author Anthony Horowitz, with the express intention of getting him to then being able to write book 2 about his cases. Now this is where it gets a little confusing for the reader because Anthony is the author himself who then also writes himself into the narrative in an autobiographical style. This took me a while to get used to in the last book as I wasn’t sure if what was happening really had happened due to the author bringing in his own lifestyle as plot points within a fictional setting! I really enjoyed this classic Murder mystery with a twist. There are clues along the way but also red herrings galore and I had absolutely no idea who the murderer was until it was properly revealed near the end. When a man is murdered using a very expensive bottle of wine and a clue is written on the wall beside him, it falls to Hawthorne to work out who and why, ably assisted by the author Anthony Horowitz who will then use the investigation to write his next bestseller based on Hawthornes experience…if Horowitz can stand his company this time! I love these characters and really do hope that this series is adapted for television. I even have the perfect actor lined up in my head to play Hawthorne ( the sublime Rupert Graves who I had in my head for this character as soon as I met him in The Word is Murder!). These books are wonderfully written crime mysteries that definitely need to be read to be appreciated for their unique approach to modern day crime solving. This is the second book in Horowitz’s Hawthorne series. It’s not absolutely necessary to read the first book, The Word Is Murder, before this one, but I would strongly recommend it. That’s in part because this series has an unusual premise that’s explained in more detail in the first book. The premise is that Anthony Horowitz, the author, is writing a fictional series in which Hawthorne is a sort of a downmarket Sherlock Holmes-ish genius, with Horowitz himself acting as Hawthorne’s Watson. Not This is the second book in Horowitz’s Hawthorne series. It’s not absolutely necessary to read the first book, The Word Is Murder, before this one, but I would strongly recommend it. That’s in part because this series has an unusual premise that’s explained in more detail in the first book. The premise is that Anthony Horowitz, the author, is writing a fictional series in which Hawthorne is a sort of a downmarket Sherlock Holmes-ish genius, with Horowitz himself acting as Hawthorne’s Watson. Not only does Horowitz insert himself in the novels, but he has his book character talk a lot about Horowitz’s real-life work as an author and the creator of television series, especially Foyle’s War. This is the kind of meta thing I usually roll my eyes at, but I enjoy it in this case. Hawthorne is a former police detective who now consults for the Metropolitan Police when they run into a particularly high-profile or difficult murder case. In the first book, The Word Is Murder, Hawthorne almost bullies Horowitz into agreeing to write a book about Hawthorne and his detection methods. Horowitz tags along when Hawthorne is called in on a case and, much to the frustration of both men, he tries to work the case too, rather than just take case notes for the book to come. That first case is solved, Horowitz has finished writing the book and just the arrival of the publication date awaits. This gives Horowitz time to get back to one of his many other projects, writing scripts for the Foyle’s War series. But Hawthorne, in his usual single-minded inconsiderate way, crashes onto a Foyle’s War scene being filmed in London. He wants to drag Horowitz away to join him as he sets off to the scene of a murder that he’s just been hired to work on. The murder victim is Richard Pryce, a divorce lawyer (insert lame jokes here). Pryce not only has made many enemies in his work, but also was part of a tragedy years ago that resulted in the death of a close friend. The investigation doesn’t suffer from a lack of suspects and, as with the first book in the series, Horowitz skillfully leads the reader down a path that twists—and several times turns back on itself when Horowitz spots inconsistencies, makes connections others haven’t seen or recasts the accepted meaning of some plot element. The mystery plot is fascinating and really makes the book, but the story was almost ruined for me because of one element. One of my pet peeves in crime fiction is the all-too-common depiction of police detectives behaving like total jerks to witnesses and especially to non-police investigators. Even though Horowitz the character notes that in his experience it’s unfair to portray police detectives as aggressive or corrupt, what does Horowitz the author do in this book? You guessed it: he features that very thing. Detective Inspector Kara Grundshaw the Metropolitan Police’s chief investigator assigned to the case, is physically and verbally abusive to the Horowitz character. It happens right from the get-go, continues throughout the book and is completely over the top. Worst of all, there doesn’t seem to be any reason for it than to create conflict. I just hate that ginned-up conflict stuff. This is the latest and second in the Daniel Hawthorne series. I haven’t read the first but this in no way detracted from my enjoyment of this novel. Hawthorne has been brought in to investigate the murder of Richard Pryce, a high profile (and expensive) divorce lawyer whose throat has been slashed by a broken bottle of very expensive wine. His capacity in investigating the crime is a little vague, but it is crystal clear that there is no love lost between him and the senior investigating officer, Cara Grunshaw (what a great name – almost Dickensian). The likely suspects are lined up for the reader and the investigation begins. Hawthorne has a sidekick who fancies himself as a bit of a sleuth. Anthony has agreed to write three books for his publishing house around the exploits of Hawthorne but, after the first case, has become increasingly unwilling to complete his contract. Will this be the case to change his mind? Theirs is a bit of a love/hate relationship, and I was wondering which way it would go. I thoroughly enjoyed the story, despite having worked out who the killer was by the time all the various threads were being drawn together. Hawthorne and Anthony are a present-day Holmes and Watson – the one being an observant professional and the other being a professional out of his depth. It’s a good set up and one that still works well. All the clues are presented to the reader who finds himself racing, along with Hawthorne, Anthony and Grunshaw, to be the one to solve the murder first. The dialogue is excellent and develops the somewhat turbulent relationship between the two main protagonists very well but it’s the mysterious background of Hawthorne which led me on and wanting more. The murder investigation for me was almost a sideshow at times. Clearly, something of Hawthorne’s background was revealed in the first novel, and we get to learn a little more in this one. It’s an excellent mechanism to maintain the reader’s interest and one which is used perfectly by Horowitz. The sidekick author has been contracted to write three books – I can only hope that the contract is extended. Great reading. Anthony Horowitz, OBE is ranked alongside Enid Blyton and Mark A. Cooper as "The most original and best spy-kids authors of the century." (New York Times). Anthony has been writing since the age of eight, and professionally since the age of twenty. In addition to the highly successful Alex Rider books, he is also the writer and creator of award winning detective series Foyle’s War, and more recent Anthony Horowitz, OBE is ranked alongside Enid Blyton and Mark A. Cooper as "The most original and best spy-kids authors of the century." (New York Times). Anthony has been writing since the age of eight, and professionally since the age of twenty. In addition to the highly successful Alex Rider books, he is also the writer and creator of award winning detective series Foyle’s War, and more recently event drama Collision, among his other television works he has written episodes for Poirot, Murder in Mind, Midsomer Murders and Murder Most Horrid. Anthony became patron to East Anglia Children’s Hospices in 2009. On 19 January 2011, the estate of Arthur Conan Doyle announced that Horowitz was to be the writer of a new Sherlock Holmes novel, the first such effort to receive an official endorsement from them and to be entitled the House of Silk.